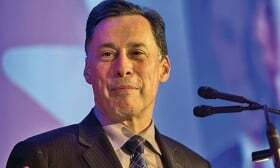 Ontario Minister of Economic Development Brad Duguid urged GM and Unifor to find a resolution to the strike as quickly as possible. TORONTO -- The Government of Ontario urged General Motors and striking union workers on Thursday to immediately resolve a month-long strike at GM’s plant after the U.S. automaker threatened to move all production to Mexico. Contract talks stalled over job security and led to the longest strike in 25 years at the factory, known as CAMI, which makes the popular Equinox sport utility. The issue is escalating just as Prime Minister Justin Trudeau discusses the North American Free Trade Deal with U.S. and Mexican leaders. “I feel like we’re engaged in a poker game, but the interests of Ontario are sitting on the table right now,” Ontario Economic Development Minister Brad Duguid told Reuters. Duguid spoke with officials from General Motors Canada and Unifor during the week of Oct. 2. About 2,500 workers at a factory in Ingersoll, Ontario, walked off the job on Sept. 17 after GM rejected the Unifor labor union’s call for the automaker to designate the factory as the lead production site for the Equinox in North America. On Wednesday, GM warned Unifor leaders that it would start winding down production at the CAMI plant unless workers called off their strike. GM officials told the union that it would ramp up Equinox output at two plants in Mexico if the walkout continued, Unifor President Jerry Dias told Reuters. The automaker also has underutilized plants it could retool in order to produce the Equinox in the United States. But, a GM official familiar with the contract negotiations said the automaker has not made a decision on the future of CAMI, but that the time frame for getting a deal done is narrowing. The strike is also affecting the plant’s supply chain, said Duguid, who is aware of about 1,000 workers in other plants who have been temporarily laid off pending the outcome of the dispute. GM has invested $800 million to retool the CAMI plant and is projected to build about 210,000 vehicles in 2018, according to AutoForecast Solutions, a forecasting firm. The two GM Mexico plants are together projected to build 149,000 vehicles next year. The Equinox was the second best-selling model in the United States Chevrolet lineup in September, and GM had just 41 days worth of the vehicle in stock at the end of last month, according to the Automotive News Data Center in Detroit. U.S. sales of the Equinox surged 22 per cent to 212,735 vehicles through the first nine months of the year. Canadian Equinox sales rose 27 per cent to 2,079 in September. Through the first nine months of 2017, Canadiansales are up 38.5 per cent over last year. Shares in GM were down 1.7 percent on Thursday morning, as the Wall Street Journal reported that the company plans to temporarily close its Detroit-Hamtramck assembly plant.